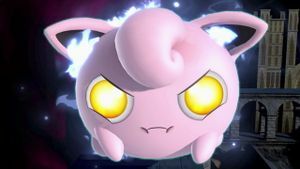 Puff Up (おおきくなる, Grand Growth) is Jigglypuff's Final Smash. When used, Jigglypuff slowly inflates itself to a very large size, enough to almost entirely cover a small custom stage. While growing, enemies and items will be pushed away. Once Jigglypuff reaches its full size, it shouts "JIGGLY!!!" and shrinks, which causes a massive push that will most likely KO any enemies too close to its body. Jigglypuff then quickly deflates. While Jigglypuff is deflating, it will cause 18% (17% in SSB4) damage and powerful knockback upon contact, similar in power to the push effect. This is in effect until Jigglypuff is back to its original size, making contact dangerous until the Final Smash ends. While the move covers a very large range, it loses potency quickly on larger stages, and cannot affect anything below Jigglypuff (though this can be remedied by having Jigglypuff start the attack from below the stage, which will let it expand up and through the stage.) Also, it can affect teammates even when Friendly Fire is off. There is a glitch in Super Smash Bros. Brawl where the terrain in some stages (such as Bridge of Eldin) touches Jigglypuff and knocks it out of the move, yet it remains the same size it was when it was forced out of the Final Smash. If Yoshi (or Kirby with Yoshi's ability) uses his Egg Lay on Jigglypuff after this, or Jigglypuff picks up a Super Mushroom, its size doubles, allowing Jigglypuff to become the biggest character in the game. Its size resets when it uses the Final Smash again or gets KO'd. As a pun on its enormous size, the glitch Jigglypuff is often called "Bigglypuff", "Gigapuff" or "Gigalypuff" by fans. When the glitch is performed, Jigglypuff will still have the strength it had when it was at its standard size. Jigglypuff will appear to move very slowly, having the illusion of not being able to jump very high, as well as falling slowly, all attributes equal to when it was at its regular size. As a result of these large hitboxes, should Jigglypuff roll or use its forward smash with the glitch, it will likely self-destruct, as if any hitboxes come in contact with the blast line, Jigglypuff will be KO'd. Although Puff Up does not seem to originate from the Pokémon games, it does appear to be based on Jigglypuff's other appearances in various media such as its appearance in the anime where it "puffs up", which may also be based on its classification as the "Balloon Pokémon". Puff Up trophy in Brawl. Puff Up trophy in for Wii U. When Jigglypuff uses its Final Smash, it starts to grow bigger. And bigger. And bigger! Before you know it, Jigglypuff will have completely taken over the screen-and there's no way to make it stop. On smaller stages, fighters may find there's nowhere left to stand! At near full size, Jigglypuff will damage and launch anyone it touches. It doesn't deal a lot of damage or launch opponents a long way. No, when Jigglypuff uses its Final Smash, it gets...bigger. And bigger. And bigger. Before you know it, Jigglypuff will have completely taken over the screen - and there's no way to make it stop. On smaller stages, fighters may find there's nowhere left to stand! Puff Up inSuper Smash Bros. for Nintendo 3DS. Puff Up in Super Smash Bros. for Wii U. Puff Up as shown by a Skill Preview in Ultimate. The eyeball glitch in a match, and in a victory animation. Jigglypuff's size before using the Final Smash affects the size it grows to. In a Giant Brawl, it can grow to a size where only its face is visible on screen. Puff Up is one of the five Final Smashes that can affect a team player. End of Day, Landmaster, Iceberg and Galaxia Darkness (in Brawl only) share this trait. It is also one of the only two Final Smashes that can damage an ally directly when Friendly Fire is off. Galaxia Darkness shares this trait in Brawl. If many characters get stuck between Jigglypuff and a wall at once, the effects get slowed down. Not counting custom moves, this is Jigglypuff's only special move in the Super Smash Bros. series that does not originate from the Pokémon series. Most of Jigglypuff's attacks cause it to look in a certain direction while performing a move, and if this applies to the move Jigglypuff broke the Smash Ball with, then after using the Final Smash, it will look in that direction until it uses an attack or air dodge. This glitch can even carry over into two of its victory animations (with the third cancelling the glitch due to its eyes already being scripted to look to its right). This page was last edited on March 19, 2019, at 21:58.